Synthetic phosphopeptide derived from human Bad around the phosphorylation site of Serine 155. Our Abpromise guarantee covers the use of ab28825 in the following tested applications. WB 1/500 - 1/1000. Detects a band of approximately 23 kDa (predicted molecular weight: 18 kDa). Promotes cell death. 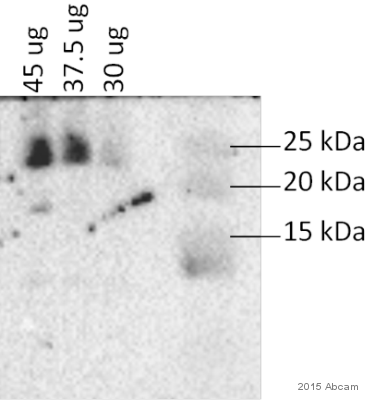 Successfully competes for the binding to Bcl-X(L), Bcl-2 and Bcl-W, thereby affecting the level of heterodimerization of these proteins with BAX. Can reverse the death repressor activity of Bcl-X(L), but not that of Bcl-2 (By similarity). Appears to act as a link between growth factor receptor signaling and the apoptotic pathways. Expressed in a wide variety of tissues. Phosphorylated on one or more of Ser-75, Ser-99, Ser-118 and Ser-134 in response to survival stimuli, which blocks its pro-apoptotic activity. Phosphorylation on Ser-99 or Ser-75 promotes heterodimerization with 14-3-3 proteins. This interaction then facilitates the phosphorylation at Ser-118, a site within the BH3 motif, leading to the release of Bcl-X(L) and the promotion of cell survival. Ser-99 is the major site of AKT/PKB phosphorylation, Ser-118 the major site of protein kinase A (CAPK) phosphorylation. Ser-75 is phosphorylated by AKT/PKB, protein kinase A and PIM2. Mitochondrion outer membrane. Cytoplasm. Upon phosphorylation, locates to the cytoplasm. Ab28825, at a concentration of 1/50, staining Bad in paraffin embedded human breast carcinoma tissue by Immunohistochemistry. Right image: treated with synthesized phosphopeptide. Publishing research using ab28825? Please let us know so that we can cite the reference in this datasheet. Your credit note ID is 19867.